It is not clear, then, whether MURPHY’s death really was directly related to his duty at the Factory or whether his death was used to bolster existing arguments in favour of removing the constables from duty at the Factory. 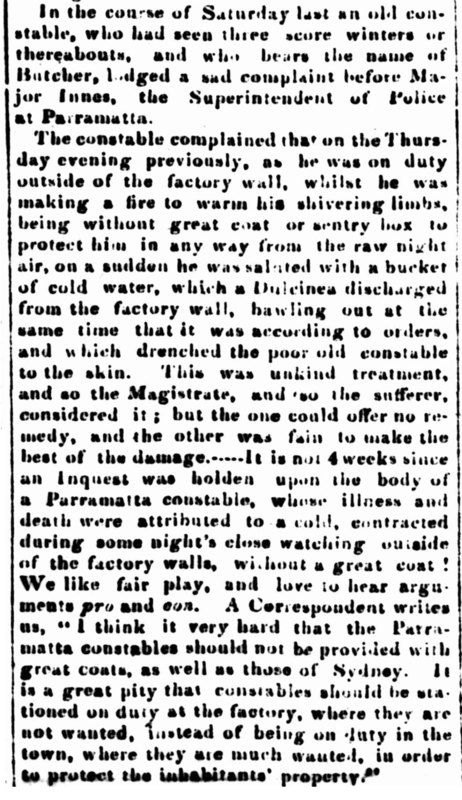 Female Factory Online (https://femalefactoryonline.org/, 2018), 27 June 1828, Report of JOHN MURPHY’s Coronial Inquest, (c18280627). Female Factory Online (https://femalefactoryonline.org/, 2018), 25 July 1828, Report on JOHN MURPHY, (r18280725). 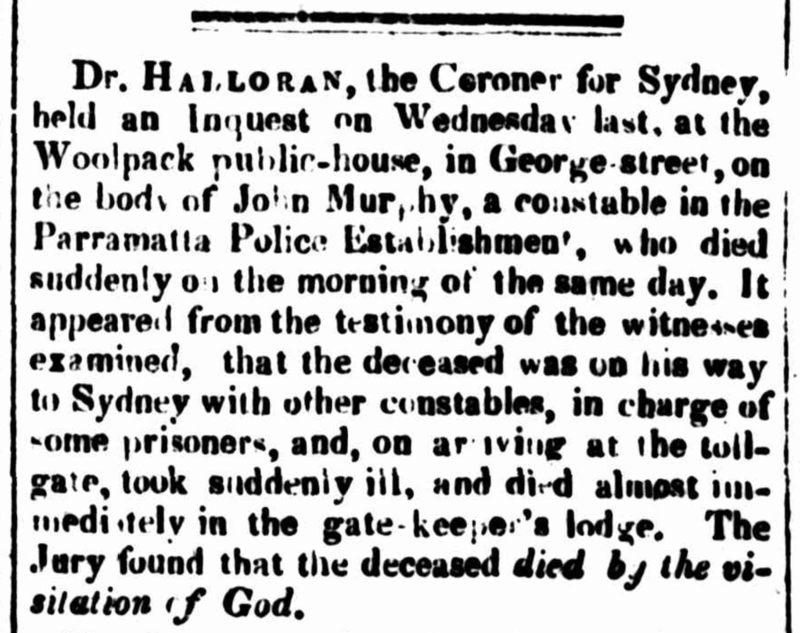 “CORONER’S INQUEST,” The Australian (Sydney, NSW: 1824 – 1848), Friday 27 June 1828, p. 3. “No title,” The Australian (Sydney, NSW: 1824 – 1848), Friday 25 July 1828, p. 3. 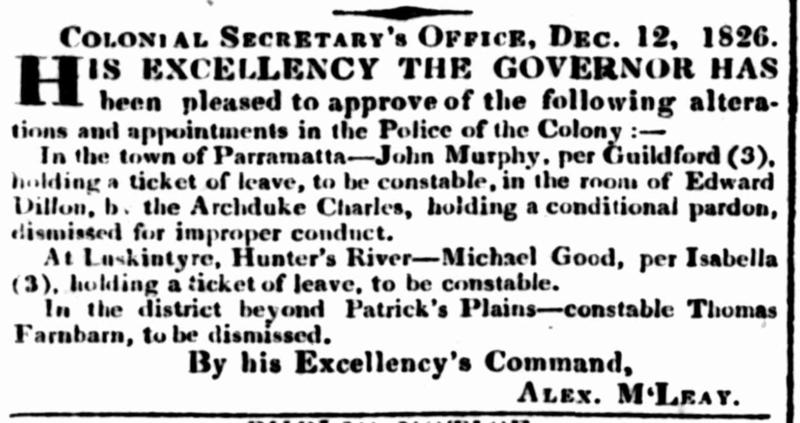 “No title,” The Sydney Gazette and New South Wales Advertiser (NSW : 1803 – 1842), Friday 27 June 1828, p. 2. “Advertising,” The Australian (Sydney, NSW : 1824 – 1848), Wednesday 13 December 1826, p. 2. New South Wales Government, Copies of letters sent within the Colony, Series: 937, Reels: 6004-6016, (State Records Authority of New South Wales, Kingswood, New South Wales, Australia). New South Wales Government, Main series of letters received, 1788-1825, Series: 897, Reels: 6041-6064, 6071-6072, (State Records Authority of New South Wales, Kingswood, New South Wales, Australia). New South Wales Government, Reports of Inquests, 1796–1824, Series: 2233, Roll: 5607, (State Records Authority of New South Wales, Kingswood, New South Wales, Australia). New South Wales Government, Special Bundles, 1794-1825, Series: 898, Reels: 6020-6040, 6070, Fiche: 3260-3312, (State Records Authority of New South Wales. Kingswood, New South Wales, Australia). New South Wales Government, Ticket of Leave Butts, 31 Mar 1827–20 Aug 1867, Series: 12202, Item: [4/4060], Fiche: 753, (State Records Authority of New South Wales, Kingswood, New South Wales, Australia). Irish Convicts to New South Wales, 1788–1848, (http://members.pcug.org.au/~ppmay/cgi-bin/irish/irish.cgi, 2011), JOHN MURPHY, accessed 3 December 2018. “Classified Advertising,” The Sydney Gazette and New South Wales Advertiser (NSW : 1803 – 1842), Monday 21 July 1828, p. 1.